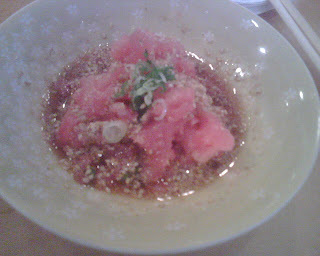 I am both happy and sad that Hiko Sushi is no longer LA's best-kept secret, no thanks to LA Weekly's food critic, J. Gold, who recently reviewed this not-so-hidden gem and led us to stand in line for the first time since we stumbled upon it over fours years ago. A few months after it opened in 2003, we were driving by and my companion suggested we try it, saying it "looks promising." I took one look at the storefront and nondescript mini-mall it was situated in, and dismissed it immediately. After he insisted we give it a shot, I broke down and agreed. We walked in, only to be greeted by a young woman who, upon knowing it was our first time there, proceeded to give us a laundry list of all the things Hiko does not do, including California rolls, teriyaki or anything cooked, stressing that it was "traditional sushi only." 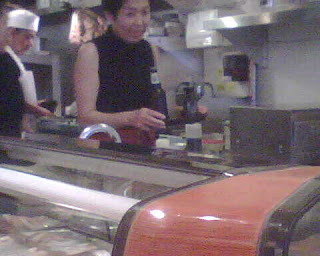 She added that if we sat at the bar, it would be chef's choice, known as omakase. Forget it, I said, slightly put off by this imposition, we're sitting at a table because I want to order what I want. The first experience was good, sampling tuna (maguro), yellowtail (hamachi), salmon and others. The best was yet to come, however. We sat at the bar on our next visit, at the complete mercy of the chef, and have never looked back since. It's too bad that on food message boards and circles, sushi chef & owner Shinji-san is known more for his strict rules and lack of "Mr. Personality"-evoking friendliness than the amazing fish and the craft he masters so beautifully every time we go. The man is an earnest guy who takes his craft seriously and doesn't care about prominent food critics or A-list celebrities who seem to flock to his no-frills establishment time and time again. Let me run down our usual sequence of jewels, infused by some anecdotes told by his daughters, who are also the wait staff. He starts us off with the most refreshing baby tuna sashimi salad, drizzled with ponzu sauce and sprinkled with tons of sesame seeds and finely-chopped green onions. Lovely. 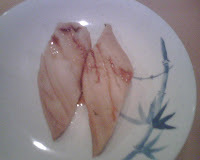 Hamachi (yellowtail) is next. Good as always. I love that he pairs the slightly cold fish slabs with perfectly cooked, warm rice. The pairing is phenomenal. Like most things, I learned to appreciate the right chewiness of the rice grains after having one too many sushi where the rice crumbled or was too hard due to over-refrigeration. I couldn't help recalling a 20-series Japanese manga(comic book) entitled "Sushi King" about the art of sushi-making and the trials and tribulations of sushi chefs and their apprentices. One book was devoted entirely to perfecting the rice -- making it from the best rice grains grown from a tiny, remote village and cooked to just the right doneness. As anticipation of our next dish starts to simmer, we dip into the freshly-grated wasabi on our plate alongside pickled ginger slices, and dissolve it with soy sauce. The light green wasabi tastes as fresh as it looks. It doesn't come cheap. A single root (photo: Wikipedia) may cost $8 to $10, and wasabi roots cost about $70 to $100 a pound. Shinji-san then offers red snapper garnished only with rock salt and a dab of grated yuzu. "No soy sauce," he says gently, meaning this one doesn't need to be dipped because it's already seasoned. Fresh with just the right tart-ness from the citrus, score again. Yuzu is a key ingredient in the much-loved ponzu sauce and is used in many other east Asian cuisines to garnish. Koreans store sliced yooja (yuzu) in honey and dissolve it in hot water to make yooja tea, a cold remedy. What's amazing about this chef, besides being a master, is that even though it is omakase, he remembers what his loyal customers like and serves them exactly in the sequence we always have it. We spotted another regular having multiple shellfish varieties that were totally different from ours. And despite outraged postings about his alleged rules of not allowing one to order the same thing more than twice, he never gave us a hard time about our requests. 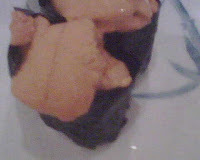 I, for example, prefer my sushi without wasabi in them and he was more than willing to oblige. In fact, he gets super apologetic when he happens to forget because his hands move so quickly. But I digress again. 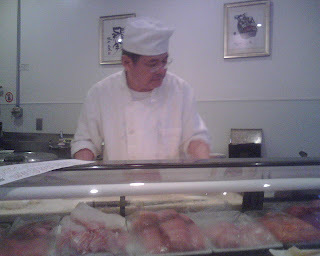 I happily await as Shinji-san assembles my all-time favorite sushi, the utterly velvety toro(fatty tuna). It just doesn't get better than this. The fat gives it an almost meaty taste and texture, full of deep flavor and melt-in-your-mouth smoothness. Every time I pop one into my mouth, I can't help but hum "mmmmm" for extended periods of time as I savor this true gem. 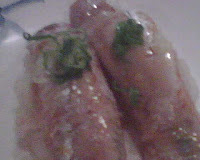 Albacore tuna with ponzu sauce topped with chopped green onions is a winner too. Then comes a small amuse bouche of sorts, tuna sashimi with ponzu sauce nested in fried wonton skin. This was on the house but would probably cost a hefty $12 at a fancy restaurant with a velvet rope. My second favorite is the blue crab handroll, a beauty that comes wrapped in a super-crispy seaweed sheet. He once told us in passing that a small box of these nori sheets cost $300. It certainly tastes like a million dollars. I appreciate his high standards even more when we venture to other much-hyped sushi joints like Sasabune and Echigo and are served sloppy handrolls on not-so-crunchy nori sheets that are torn or have pebbles of rice on the outside. These popular places have absolutely nothing on Hiko. Shinji-san is credited for making me an uni(sea urchin) convert. It turns out that I like uni -- so long as it's as fresh as the one Shinji-san serves. Prior ones I've tried had a weird smell that reminded me of the sewage system. Not good. As soon as I took my first bite of his uni, it was sheer creamy goodness. Just can't get enough. We usually wrap it up with anago (fresh-water eel) -- flash-broiled nice and warm with just a hint of the syrupy brown sauce. This one melts too. Just don't ask for more sauce. 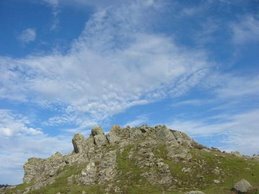 I never felt the need to ask for more, but I heard that it has historically irked the chef, to put it mildly. You won't get more, so my advice would be to trust him. You won't be sorry. 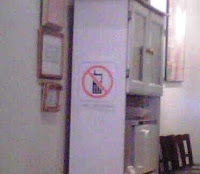 Other major pet peeves for the chef are cellphone users (that's a "no cellphones" sign you see below) and those who leave out the rice (I recently witnessed an offender who was politely told by Shinji-san's daughter, the waitress, that Shinji-san wouldn't serve her if she left the rice out) and those like Cameron Diaz who allegedly asked for more ponzu sauce (she was refused). I read a few complaints on message boards about how it was the worst service ever but it isn't surprising when they proceed to reveal that they had violated his rules and thus disrespected him. When they protested, some were promptly kicked out. I wish more restaurants had a zero-tolerance policy on obnoxious customers. On occasion, Shinji-san has served up bonito (yes, the fresh version of bonito flakes, those animated shavings that dance when you sprinkle atop an okonomiyaki, Japanese pancake), sardine and monkfish liver. All were fresh but I wouldn't say they were my favorites. Two very thin slices of fruit is the complimentary dessert. I should also add that Shinji-san has a disdain for loud people. When a group of young, bubbly and loud kids raved about how good the sushi was and that they would bring their friends next time, Shinji-san didn't flash an ounce of a smile and grunted, "Next time, be more quiet." Terrified, they smiled awkwardly and ran for the door. I suppose it's his prerogative to dislike loud people in his establishment. The funny thing is, the chef doesn't even know celebrities like Josh Harnett or Scarlett Johansson who allegedly stopped by for a bite -- not to mention a Pulitzer Prize-winning food critic who could give him a huge business boost (Let's just say he doesn't plan on framing the LA Weekly review and putting it up on his wall). And when asked what he thought about the positive LA Weekly review, he said it was true. When asked what he thought about the critic, he shrugged and said, "I don't care." His self-assuredness often passes as arrogance. He's an artist, what can I say? Disclaimer: My budget hasn't allowed me to try perennial favorites such as Ursawa and Nobu (although I did try Nobu in Las Vegas and it wasn't all that), but I have tried the overrated Kiriko (blah) on Sawtelle, in addition to the aforementioned Sasabune and Echigo. In NYC, I have tried Tomoe Sushi (not worth the wait), Blue Ribbon Sushi (yuk), Nobu Next Door (not great) and more recently, Shimizu (innovative sushi), all of which were not as good as Hiko. At the risk of ruffling some feathers, I hereby anoint Hiko to be the best sushi in all of the US. Make no mistake. 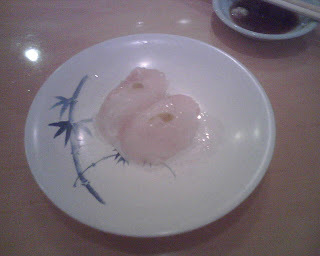 This meal won't come cheap -- about $70 per person including tax and tip if you do omakase without drinks or miso soup. Lunch won't be any cheaper. The illogical but convenient trend of charging less for the same items for lunch doesn't apply here. I have also seen them turn away multiple customers who asked for take-out. How do you expect the sushi to hold up when the steaming rice is straight out of the rice cooker? I am heartened that it's doing as well as it is, as I was concerned when I saw the empty tables on weekends throughout the years. It's a family-run business where wife and children all pitch in, and that makes me want to support it even more. If you ever decide to try it, tell him you read it here. He'll know it was me and I guarantee you he won't kick you out unless you violate his rules! My only complaint is that they need to diversify their music choices. Shinji-san is an avid fan of bossa nova singer, Lisa Ono, and he is in desperate need of some new music infusion. I'm tempted to bring him a new CD on my next visit. I've decided to include an address for all restaurants I review from now on. NJ ain't kidding about the quality -- or the price. Wasn't a certain Venice resident involved in suggesting this place? give me some credit, phas. we suggested it to that venice resident, but not sure how much this person liked it b/c of the strict rules. i suspect this person was put off by it and isn't as much as a devotee as i am. i believe that person frequents echigo more due to its (baby-) friendliness. my favorite place for sushi!